AS mice exhibit exaggerated epileptogenesis. (A) Experimental paradigm of flurothyl kindling and retest followed by kainic acid–induced (repeated low-dose injection of 5 mg/kg i.p. every 30 minutes) or hyperthermia-induced seizure. Latency to (B) myoclonic and (C) generalized seizure in WT and AS model mice during flurothyl kindling and retest. ##P < 0.01 compared with day 8 of AS model mice; ****P < 0.0001 compared with WT; 2-way ANOVA with Bonferroni’s post hoc test. (D) Representative EEG trace of a spontaneous recurrent seizure (SRS) with corresponding spectrogram recorded from a WT mouse during the incubation period. (E) Group analysis of SRS incidence, recorded every other day during the 28-day incubation period following flurothyl kindling. (F) Correlation for individual WT (gray) and AS (green) mice between SRS frequency during incubation period and myoclonic seizure threshold at flurothyl retest. 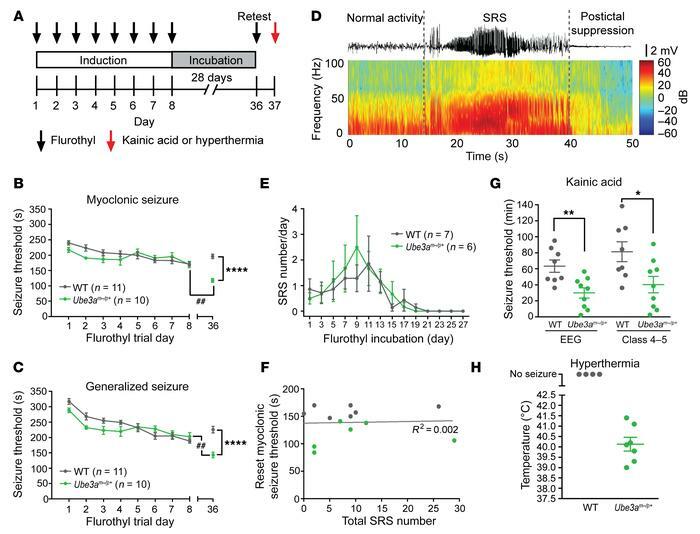 (G) Latency to the onset of repeated low-dose injection of kainic acid–induced EEG and class 4 to 5 behavioral seizure in kindled WT (n = 8) and AS (n = 9) model mice. *P < 0.05, **P < 0.01 by unpaired t test. (H) Hyperthermia-induced seizure incidence and body temperature at which generalized seizure occurred in kindled WT (n = 4) and AS (n = 7) model mice.